I’ve thought about your query about your “content specific” American literature class a lot, and I keep getting stuck on one question: Does the class have to revolve around full-length American novels? I ask this for a couple of reasons. First, in my experience, many 11th grade teachers, in Texas at least, think that they have to teach English III as a survey of American literature; however, the curriculum standards (Texas Essential Knowledge and Skills or TEKS) do not mandate that. Yes, there is a standard that requires students read American literature, plus another that says American drama, but there are 11 other reading standards (plus Fig.19, which is a whole other story) and at least that many writing standards. All of these standards are classified as either readiness (they will be tested on state exams) or supporting (they may be tested). The standards mandating American literature are supporting — meaning perhaps that they might not carry as much weight as readiness. Yet many teachers design their whole year’s worth of reading around one American novel or play after another, at times ignoring all the other reading standards that state that students should read a variety of other texts — fiction and non-fiction. Seems to me that if we do a mash up of all the reading standards we’d come up with one overarching goal: Create readers. 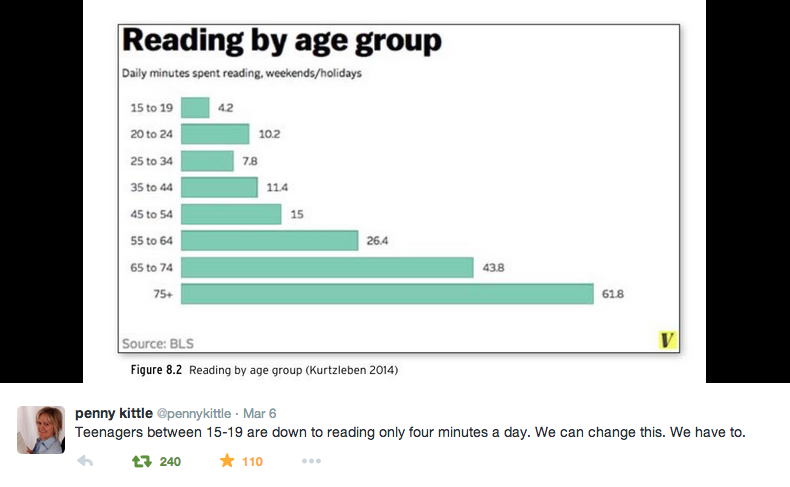 How can we create readers if students are not reading? More and more research proves this is so. Many of the junior level teachers here teach the American literature survey because that is the way it has traditionally been done — prior to the changes in the standards, almost 10 years ago, and our new state tests, three. Most have not learned how to do anything differently — like facilitating readers and writers workshop. So, I wonder about the standards that drive your class. Are they like the TX ones that require some American lit, or is the class designed by your campus and/or district to be one focused on a survey of American Lit? If it’s the first, give yourself permission to let some of those whole class novels go. You can step right into allowing more student choice. You can select short texts to read together, conduct book clubs where students still get choice but with your parameters. Imagine the possibilities for short stories and passages where you can teach the same skills you focus on when you teach those full-length novels. If it’s the second, I wonder what you can do to change the course design. 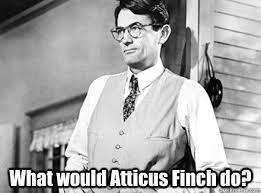 Would your administration be okay with you taking a more balanced literacy approach and only reading some of those whole-class texts? You will have more time for writing, and you’ll have a better chance of moving students as readers because odds are you’ve got many students who are not reading those books. We’ve all been there. If you haven’t read the English Journal article Not Reading: The 800 Lb Mockingbird in the Classroom, it is a fantastic piece that reiterates the problems of students faking their way through their reading. Another great article is this one by Tim Pruzinsky, an IB teacher at an international school in Thailand. IB mandates specific texts, but Tim still manages to get all of his students reading novels of their choice. 1. Intentionally decide which of your current novels are nonnegotiable. Which book do the majority of your students read? Which book adds the most to your reading community in terms of discussions that build relationships? Which book are you able to teach the most skills that students can apply to their own independent reading? Keep that novel (or a couple of novels) as your whole class texts. 2. Decide to read fewer whole class novels and increase your reading of shorter whole class texts. How can you teach some of the skills you normally do with novels with short stories, poems, and a variety of non-fiction pieces? 3. Decide what type of writing will benefit your students most. Choose mentor texts that relate thematically to the novel/s you let go. You can still have the rich discussions surrounding a text and teach annotation skills without mandating another whole class reading assignments. 4. Select a short stack of books and facilitate Book Clubs. Students choose a book from the list to read and discuss with their peers in small groups. Visit each group and briefly join the discussion to hold students accountable for their group time. You might conduct Book Clubs 2-4 times a year to allow for choice with parameters and to ensure that all students reach for books that meet your ideal of complexity. 5. Decide to promote reading in your classroom and take no excuses from students. Talk about books and reading daily. Devote 10-15 minutes of self-selected reading time at the beginning of every class period. Confer with students about their reading regularly. Read a lot, so you are able to match students with books that they will want to read. Anyone have other ideas to help make the move to more balanced literacy? Please leave a comment. A, I think this is an essential question. I think many educators (trying to do what’s right for students) are concerned that they do not have administrative support. But, as you pose this question, I think it opens up some of the real thinking and dialogue behind the halt in movement. There’s the radical approach. (One I tend to prefer!) As the expert in our own classrooms we have the most accurate scope on what students need so we figure it out, customize it, and roll it out regardless of push back. There’s the compromise approach which you detail so, so well here. The give and take. Let’s find a way to adhere to administrators’ (states’) mandates while playing with all of the ways in which we can still educate students in a way where they have exposure robustly full with risk and success. Thank you for posing this question as I think it opens up a realm of possibility. Collectively, from coast-to-coast, we have the responsibility to use each other as resources in figuring out the ways that the students sitting in all of our classrooms can benefit from innovation, rigor, and possibility. Thanks for this, Erika. Your thinking always helps my thinking.